So, here we are! January is gone already, and we are well into 2015, which means it is time for me to post my first Biscuit Barrel round up. I must say, I was absolutely delighted by the number of entries. Since January is the month for dieting, I had been a bit concerned that no one would be baking! But plenty of you have carried on gallantly making indulgent and delectable bakes, while others have taken a healthier approach and come up with clever vegan and gluten-free recipes. Thanks to all of you who joined in for stepping up to the theme of “innovation and discoveries” and sharing your finds with the Biscuit Barrel. And now, enough chatter, let’s get to all the lovely bakes. First up are these gorgeous Banana-and-White Chocolate Cookies from my friends Rosemary and Pork Belly. They are gluten-free and vegan, using mashed banana in place of egg to bind the cookie dough. So nearly everyone can enjoy one, and really, it would be a shame for anyone not to be able to swipe one of these off a platter! My own submission came early in the month, while I was still doing the series of reviews on my prize Christmas hamper. 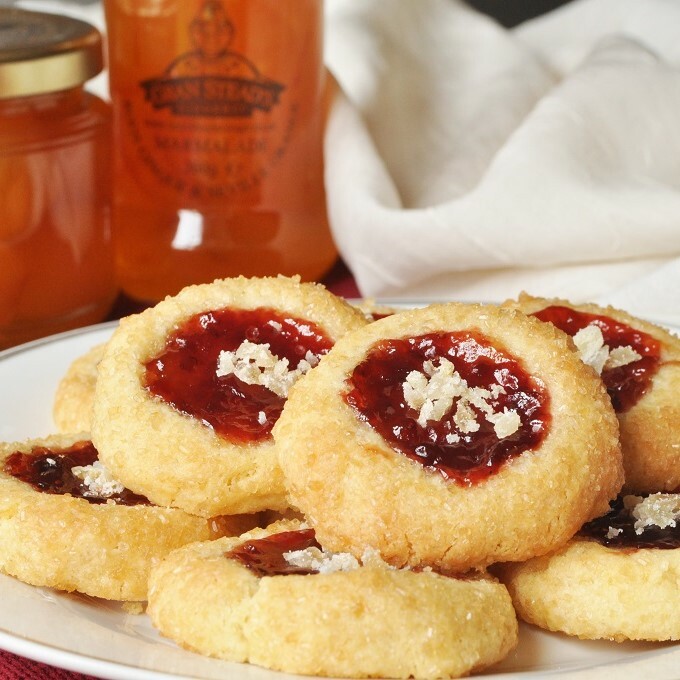 I had received strawberry preserves from Deerview Fine Foods and ginger jam from Gran Stead’s Ginger, so decided to put them together in this recipe for Ginger-Strawberry Jam Shortbread Thumbprints. I had seen the combination suggested in a recipe from Jamie Oliver’s Great Britain (one of my Christmas presents) and was keen to give it a go. It is, I am happy to declare, every bit as delicious a pairing as I had thought it sounded. From our lovely Laura of I’d Much Rather Bake Than . . ., the force behind The Biscuit Barrel, come these enticing Green Tea White Chocolate Shortbreads. 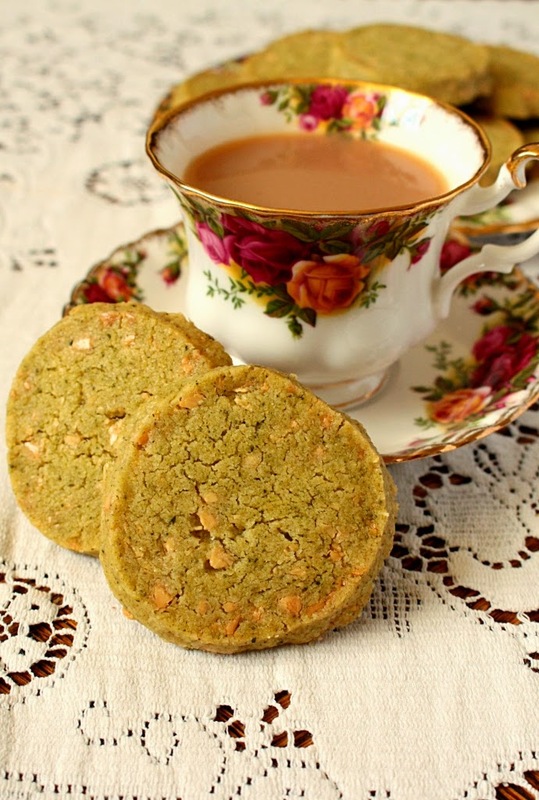 I love green tea and white chocolate together, and of course, shortbreads are always welcome. Although perhaps these are particularly so. 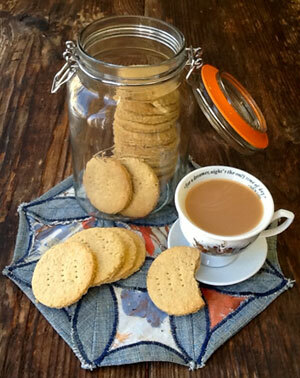 As Laura says, “There is always time for tea.” And what is a cup of tea without a sweet biscuit to nibble on alongside it? And speaking of tea . 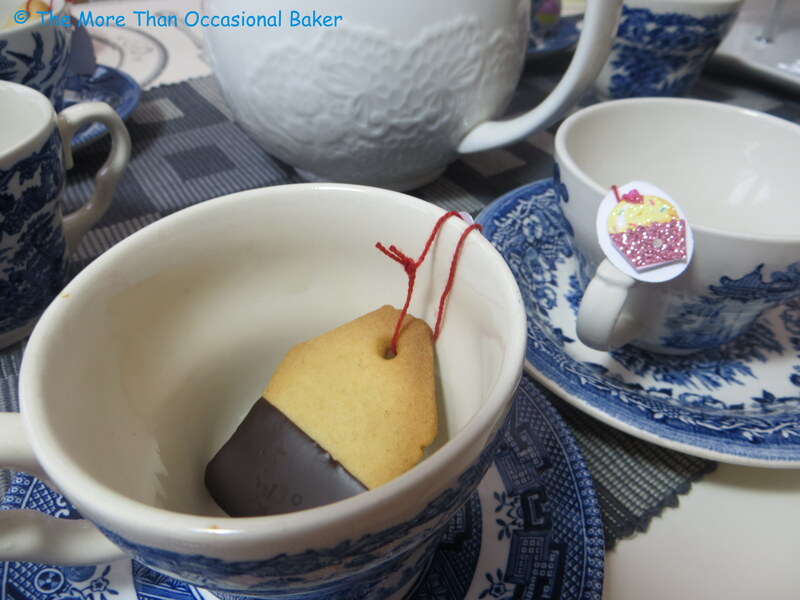 . . how about these absolutely adorable Tea Bag Cookies from Ros of The More Than Occasional Baker? She made them for her afternoon tea New Year’s Party, and the guests were quite impressed. As, I believe, are the rest of us. I can promise you I will be pinching this idea next time I host a tea party. So, so clever. 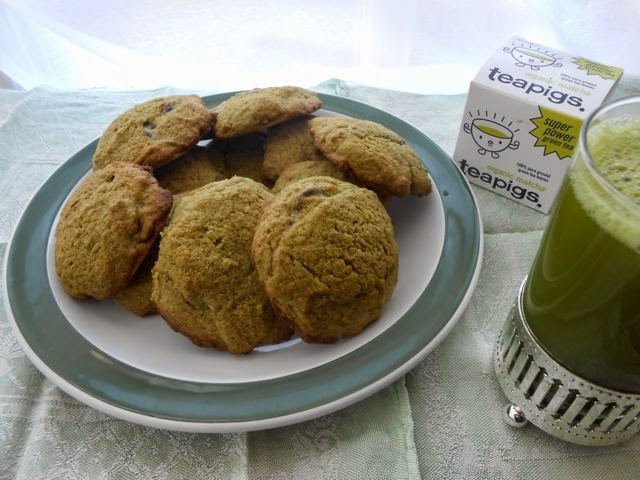 More green tea is brought to us by Choclette of Chocolate Log Blog in these Matcha Spelt Chocolate Chip Cookies. Apparently there was a #MatchaChallenge hosted by Teapigs this month–how did I not hear about this? Quite sad to have missed out on a green tea baking spree. But to console myself, I could always bake a batch of these cookies, which Choclette promises remain soft (and beautifully green!) on the inside whilst the outside is crunchy. Just the way I like my chocolate chip cookies. 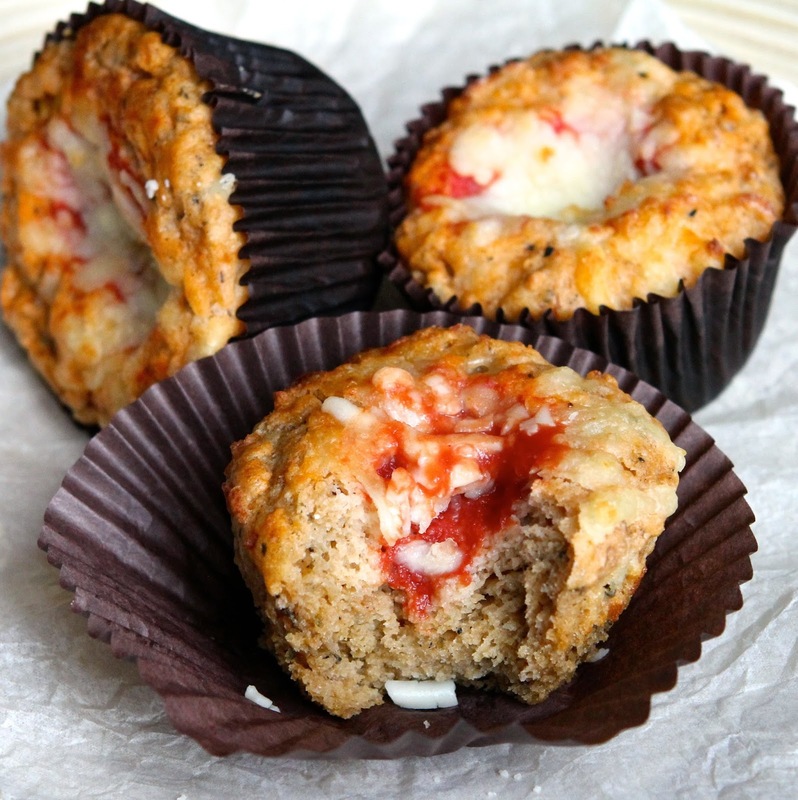 Kate, The Gluten-Free Alchemist, has thrilled me by submitting a savoury recipe, one for irresistible-sounding Pizza Muffins, which she says are the best discovery that she has made in a long time. Don’t you want one right now? I certainly do. Such a terrific addition to a lunchbox, picnic, or mobile meal of any kind. And I have to say, the photo is stunning as well. The creativity this month has really been impressive. 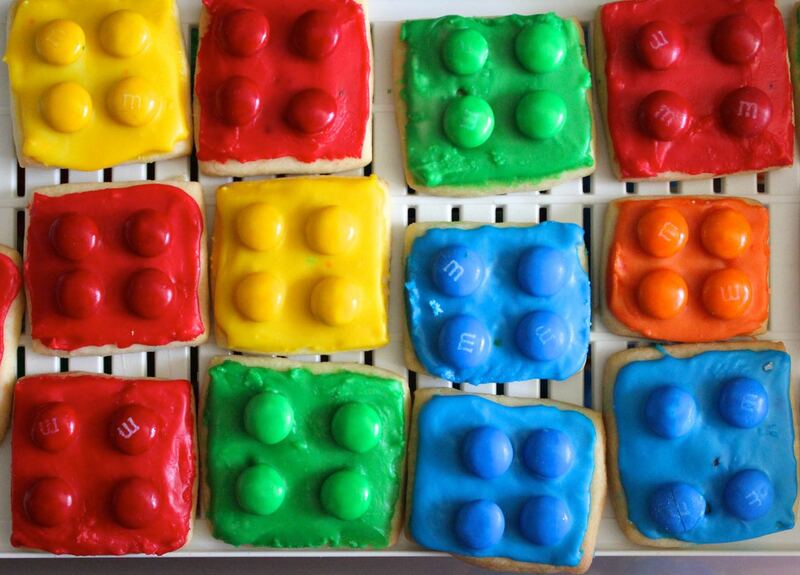 Just look at these cute Lego Biscuits from Johanna of the Green Gourmet Giraffe. They were created in honour of her nephew’s birthday (who turns out to be obsessed with Legos, so that worked out quite nicely), and I’m sure we all agree that he is a lucky boy to have an aunt willing to put out such an effort on his behalf! Johanna’s post describing the process of making the biscuits and the resulting party is a fun read, so do check it out–even if you don’t have a Lego-loving nephew. I love muesli. If you give it to me for breakfast, I’m a happy girl. I can’t imagine getting tired of eating it, but Helen of Family-Friends-Food, in order to use up two gigantic bags she had been by Cofco, decided she needed to find something a bit more exciting than just pouring it into a bowl with milk every morning. 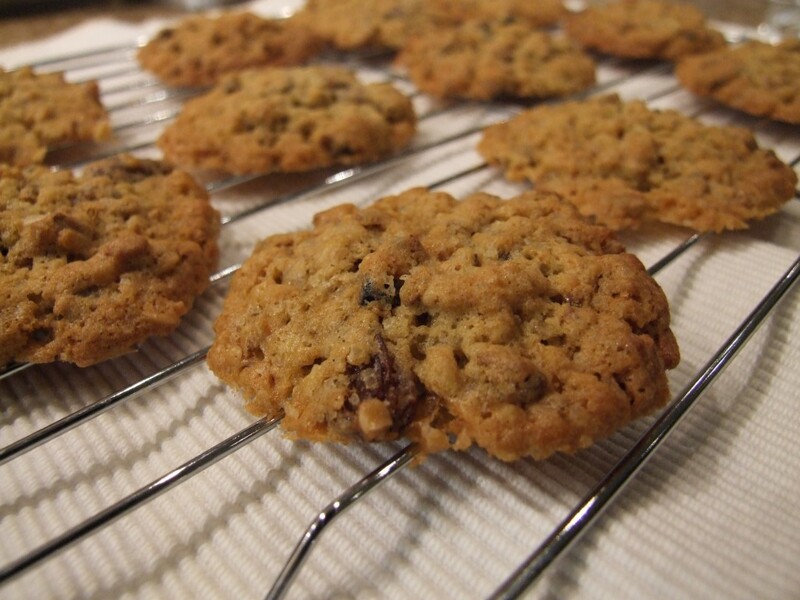 She came up with these simple and quick Muesli Cookies. Well, I’m all for that! 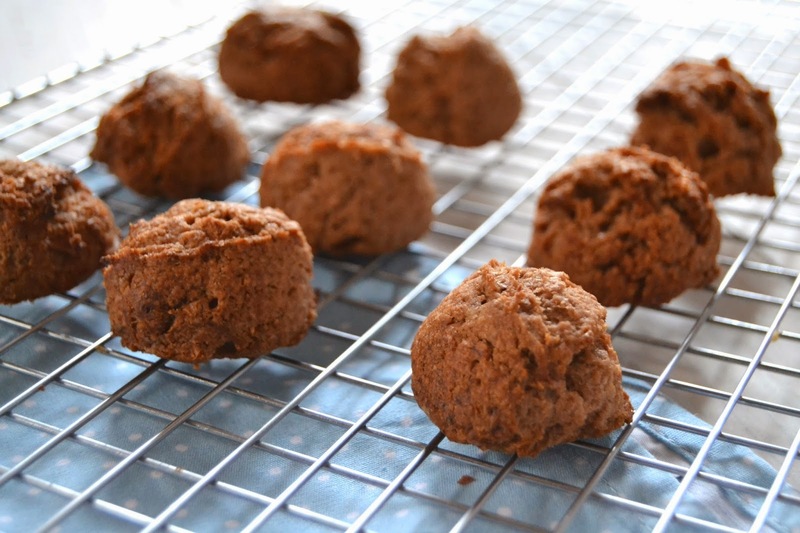 They’re look rather like oatmeal cookies, don’t they? Only better, I’ll bet. While on the topic of oatmeal cookies, I don’t think I have ever seen a more beautiful batch than these Double Chocolate Chunk Oatmeal Cookies from Elizabeth at Elizabeth’s Kitchen Diary. Her secret is grinding the oats to a flour before adding them to the dough. That’s a tip worth trying for you! And in spite of baking tempting goodies like these, Elizabeth is still progressing on her weight loss programme . . . Her secret for that? Give most of them away to the builders. The crew working behind my house, having now been satiated with plates of muffins and biscuits from my kitchen, send you their thanks, Elizabeth. Departing from the biscuit theme, we have some beautiful Pear & Vanilla Pies with Sweet Almond Pastry from Jen of Blue Kitchen Bakes. Mmm, what a dreamy combination. I am also coveting the charming blue-and-white teapot in the background of another of her photos! Suffice it to say, these pies were a featured recipe on both #BakeoftheWeek and #CookBlogShare–congratulations, Jen! Frozen mania seems to be sweeping the juvenile population with some vigour (and perhaps some of the adults as well . 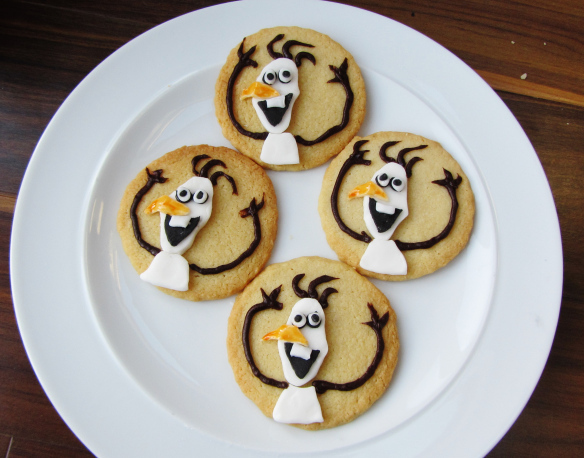 . . ), and Corina from Searching for Spice has created some cute Olaf Biscuits to satisfy her Little Miss Spice, who is currently obsessed with the film. The design may look a bit tricky, but it actually is pretty straightforward. The perfect biscuit for the aspiring princess in your house! If by this point you are moaning, “Why are you exposing me to all these temptations? I’m supposed to be being healthy this year!”, be of good cheer. Sarah of Tales from the Kitchen Shed has an offering so utterly free from offending ingredients that you can easily nibble away without a twinge of guilt. Her Healthy Digestive Biscuits are made with maple syrup rather than refined sweeteners, and, if you use margarine in place of butter, the biscuits are vegan as well. Three cheers for Sarah! 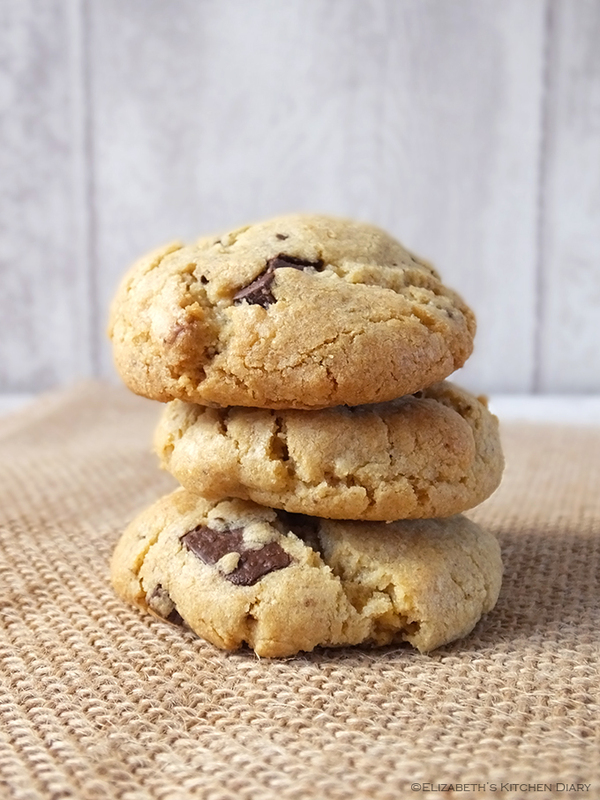 Our final recipe for this round up is another vegan, refined-sugar-free recipe: Banana, Peanut Butter, and Chocolate Cookies, courtesy of Stuart, aka known as Cakeyboi. But no recipe that involves peanut butter and chocolate can be considered a compromise on taste, no matter how healthy it is! And it’s another example of a cookie that takes advantage of using mashed banana in place of eggs, which brings us nicely full circle. Thank you for reading; I hope you enjoyed the round up as much as I did reading everyone’s entries. They are all “pinned” on my new Biscuit Barrel board as well–thanks for forcing me to finally learn how to use Pinterest! You can check back here at the beginning of February to see what the theme for the next Biscuit Barrel will be. I can promise you that it’s a “love”-ly one. What a lovely round up Alexandra. Though you may not be thanking us for forcing you onto a Pinterest when you become addicted like so many do! Er, is it a bad sign that I’m already planning my next board? I think I’m already a tiny bit infatuated . . . Glad you liked the round up! Great round up Alexandra. Thank you for hosting (and for your kind comments). I do so love the look of your thumbprints and the pear and vanilla pies look very tempting too. It is my honour to host all of your beautiful creations! Thank you so much for joining in, Kate–I’m currently plotting when will be the best time to try my hand at making pizza muffins myself. Or are they muffin pizzas . . . did you ever decide? Great round up Alexandra, so many lovely entries to drool over, I’m feeling quite peckish now! Especially yours! 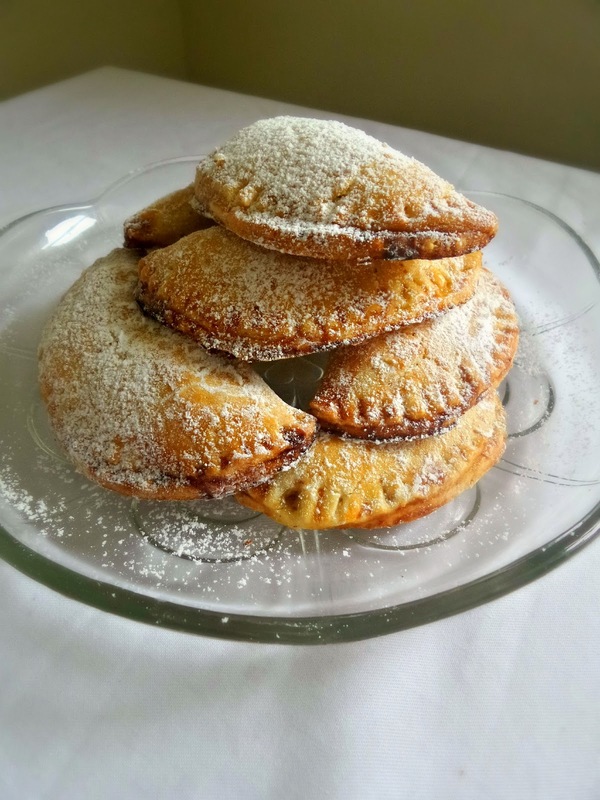 The pies are gorgeous, Jen; thank you for linking them up. What a brilliant round-up Alexandra, I love your commentary and I’m aching to try all the wonderful goodies featured here. I’m now off to investigate them in more depth. Thank you so much, Choclette. It was a lovely lot of entries, and I truly enjoyed writing up the round-up.